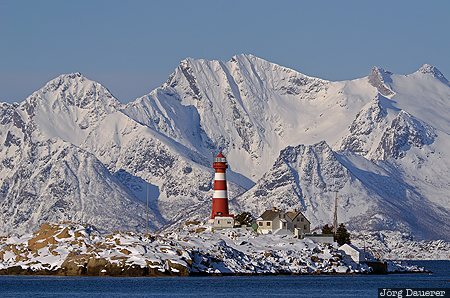 The colorful lighthouse of the small Lofoten island Skrova with the snow covered mountains of Austvågøy - the Lofoten Wall - in the background towering above the Norwegian Sea. The lighthouse is seen from the ferry between Svolvær and Skutvik. Skrova is an island of the Lofoten archipelago north of the arctic circle in Nordland, Norway. This photo was taken at noon time on a sunny day in March of 2013. This photo is part of the exhibition Lighthouses of Northern Europe (Oct'15). This photo was the image of the month in December of 2016. This photo was taken with a digital camera.